Hair dyes, highlights and bleaching can rarely lead to chemical injury. It's not common of course but the story is always the same: within seconds to minutes of applying a hair dye or highlights, the patient complains of intense burning and/or pain and requests the product to be removed. Hours to days later hair loss starts and within a week or two the patient has permanent hair loss (such as shown in the figure to the right). I have seen this type of scalp injury phenomenon many, many times and I do even feel that it is increasing world-wide. The most important thing to do in these situations of potential chemical irritation is remove whatever chemical could be causing the reaction. The dye or highlight must be removed, neutralized and rinsed off. In my opinion a dermatologist should be consulted for management and monitoring. Rarely skin necrosis can occur from ehuberant reactions. One can not predict on day 1 whether the patient will have hair loss and whether any hair loss will be permanent. This will not be clear until day 14-28. In the short term one must management skin health, prevent infection, and limit and control inflammation. These are within the skills of a dermatologist. A biopsy may be considered to determined the type of inflammation and evaluate for scarring if it is unclear. Too often I hear it said in these scarring alopecias that a biopsy was done and because the biopsy said the disease was inactive the patient proceeded to surgery. Keep in mind that we determine if a scarring alopecia is inactive by simply following what it does over time. Relying on a biopsy alone to determine if it is acitve is not a good idea for most people. If the area of hair loss has not changed at all in any way shape or form (same size area) and is not itchy and has no burning or pain thena biopsy supports it is inactive. Even if a biopsy says the scarring alopecia is inactive but the area is expanding over time and is itchy or red... it is not inactive. 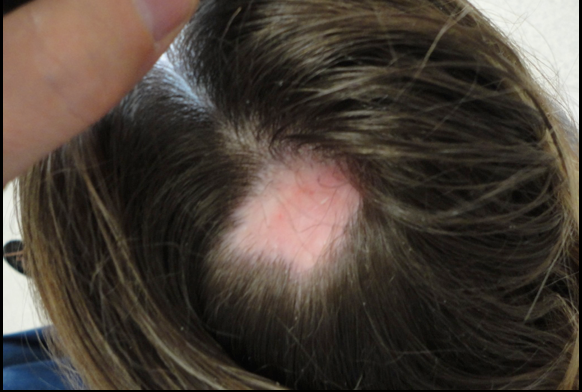 This is a common scenario and a common error in managing scarring alopecia. One needs to wait 12-24 months for a scarring alopecia before surgery. Photos need to be done every 2-3 months in my opinion even for chemical burn related hair loss. If the photos look the same when placed side by side over a one year period, one can say the scarring alopecia is probably quiet. Rarely, this can be shortened to 6 months for chemical injury but one year is a safer waiting period to be confident there is no evidence of a slowly progressive scarring alopecia in evolution. Is waiting really necessary when planning surgery in scarring alopecia? All this background waiting and monitoring needs to be done before surgery. It sounds excessive and time consuming and unnecessary- but it is far from it. Surgery for scarring alopecia can be highly successful provided it's done in the right patient. Too often, it is not done on the right patient... and then it does not work well or does not work at all and physicians, patients and the medical community as a whole loses confidence in the value of surgical restoration options. The only way to restore the appearance is surgical. Medical options do not help improve density once the area is permanently scarred. If the area is small surgery via a plastic surgeon can be a great option. Many burns from hair dyes are in the form of small coin shaped patches. A flap (rotational flap etc) can work wonders and may be superior to hair transplanting. For this a surgeon is needed with skill in such flaps. The above patient would be a good candidate for a flap. For hair loss that occurs more diffusely (and not in the above mentioned classic hair dye chemical burn patches), hair transplants can sometimes ca a good option. In my opinion, the key factor in choosing a surgeon is their experience and dedication to hair transplantation. The actual credentials is not so important to me and some of the world's top surgeons are a range of family physicians, dermatologists, plastic surgeons, former emergency room physicians. If her or she is dedicated soley to hair transplanting and has performed a large number surgeries and has been doing it for many years and has a good before and after album of scar procedures, then it may be worth a visit to speak to that surgeon.